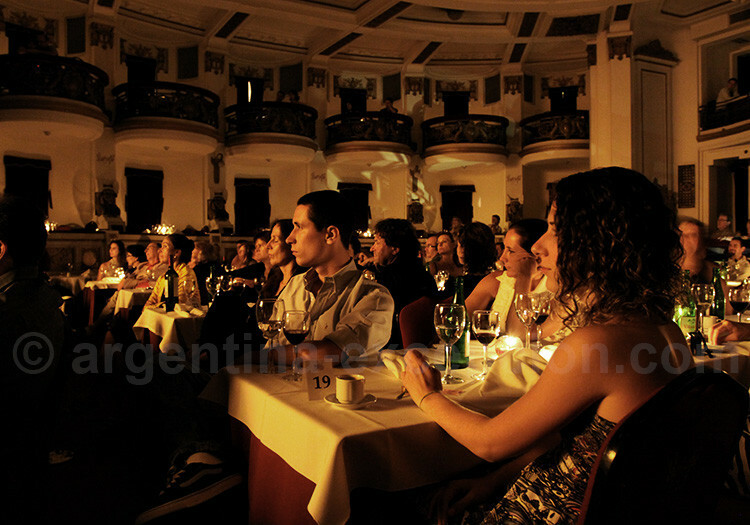 From abrazo to bandoneón, all the vocabulary that you need to know before to go to a milonga in Buenos Aires. Abrazo: The embrace. Dancers of tango milonguero never break the embrace: the face and the chest are close together, this contact enables the man to communicate with his partner and guide her. The embrace is very important because tango is a dance of dissociation between the movements of the upper part of the body and the legs. Golden years: The generation of musicians that was developed in the 1940s and 1950s with dozens of orchestras and the restoration of the tango as a popular genre and dance. Among the greatest orchestra conductors and composers we could find: Juan D’Arienzo, the King of rhythm; Edgardo Donato, Aníbal Troilo, Ricardo Tanturi, Rodolfo Biaggi, Alfredo Gobbi, Ángel D’Agostino, Carlos di Sarli, Horacio Salgán, Miguel Caló, Osvaldo Pugliese, etc. Arrabal: Slang word for suburbs. A mythical place in the world of tango, the lyrics usually made reference to them such as Melodía de Arrabal by Alfredo Le Pera and Carlos Gardel. Barrida, boleo, corte, gancho, quebrada, sacada: Tango figures/ steps. Bandonéon: The emblematic tango instrument. It was originated in Germany and became popular in Argentina at the end of the 19th century. Each button gives a different musical note whether you open or close the bellows. Among the great bandonion-players we could find: Eduardo Arolas, Pedro Laurenz, Ciriaco Ortiz, Osvaldo Fresedo, Aníbal Troilo, Leopoldo Federico, and Astor Piazzolla. Cabeceo: The nodding movement made with the head that confirms the invitation to dance. 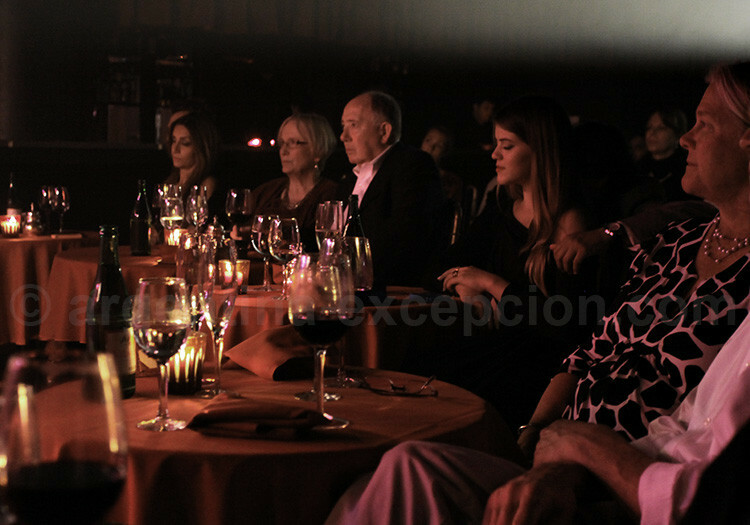 Traditionally, at the milongas, first you make an invitation with your eyesight and then with cabeceo but not going directly to the table of the chosen person. The dance partner stands up and they both meet at the dance floor. Caminar: It is the art of moving around at the musical rhythm, “caminar” is the learning base of how to dance tango. It seems easy but it is, however, the most difficult part. When the dancer manages to do the walk, he has also conquered the rhythm (the compass), the posture and the use of the dancing space, that is, the basics. Compadre: In slang, he is the chief of the neighborhood gang. He is loudmouthed, well-dressed, a hooligan and even a pimp. The compadrito emulates the compadre. Compás: The rhythm. The tango is danced by its rhythm not by its melody, that is why it is so important to have a good rhythm as it is only danced by its main tempo and counter-tempo. The “two by four” or 2×4 evokes the original rhythm of tango measured in two tempos (2/4) that was then slowed down to be measured in four tempos (4/4). Conventillo: Buildings overcrowded with immigrants and poor families located in Buenos Aires, especially in La Boca. One of the places where tango was born. Cortina: A musical interval between two series of tangos or the tandas. The cortina allows going back to you seat and invite another dancer for another tanda. Some disc-jockeys always play the same cortina, others change it to satisfy all musical tastes. 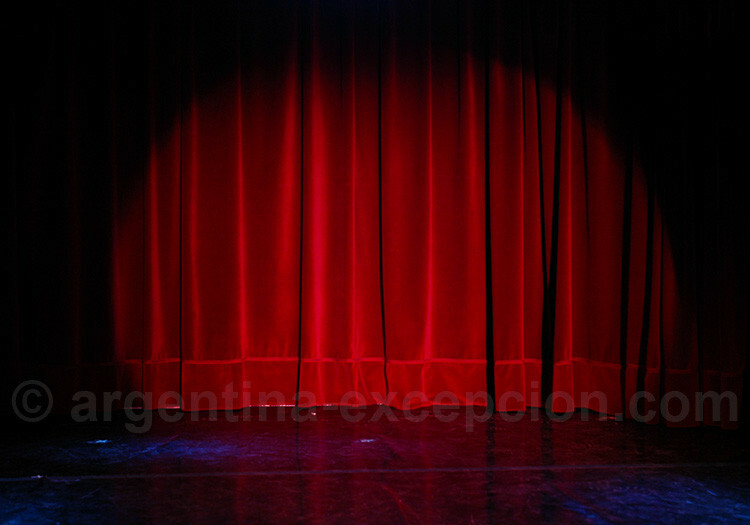 At some milongas, there are sometimes long cortinas with folk, salsa or rock music that are always danced. Giro (Turn): Generally, the male dancer is the one that makes the lady spin around him. One of the basic figures. Guardia Vieja: The first generation and the first school of tango musicians, from the end of the 19th century up to the 1920s. It is Guardia Vieja that imposed the Orquesta Típica and structured tango as a musical genre. Great characters of the Guardia Vieja were: Francisco Canaro, Roberto Firpo, and Ángel Villoldo. Most important tango songs are: El Entrerriano, Unión Cívica, La Morocha, El Choclo, La Cumparsita, etc. Lunfardo: The slang of the Buenos Aires suburbs created by immigrants. Tango script-writers used its rich and metaphoric vocabulary for a long time. Milonga: The word milonga refers to the dance and to any place where tango is danced as well as to the binary musical style, more agile and lively than tango. Because the music is faster, milonga steps are shorter. Milonguero: That who sold his soul to tango! 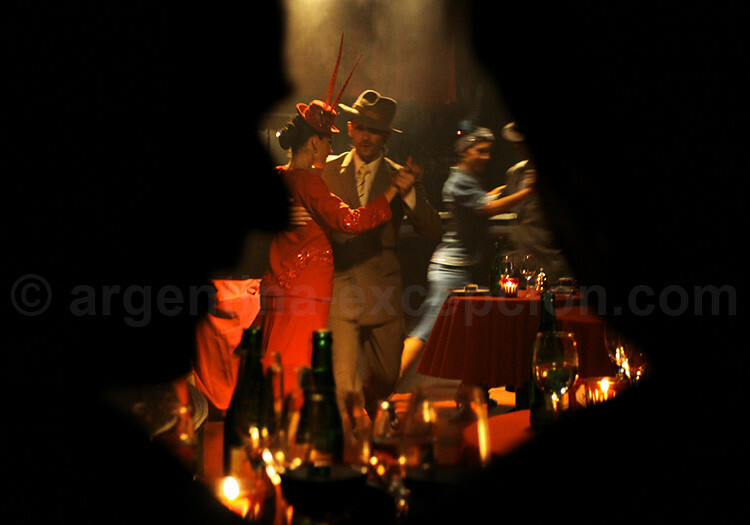 A milonguero spends the evenings at the milongas and organizes his life for tango. He is one of the columns of the dance. Ocho: A basic tango figure: a succession of steps crossed forwards or backwards making an eight figure. Orquesta Típica: An emblematic tango formation, the Orquesta Típica appeared in the 1910s together with Guardia Vieja. The typical orchestra is made up by bandonions (usually four) and violins (idem) for the melody and a piano and double bass for the rhythm. The flute and the guitar tended to disappear. 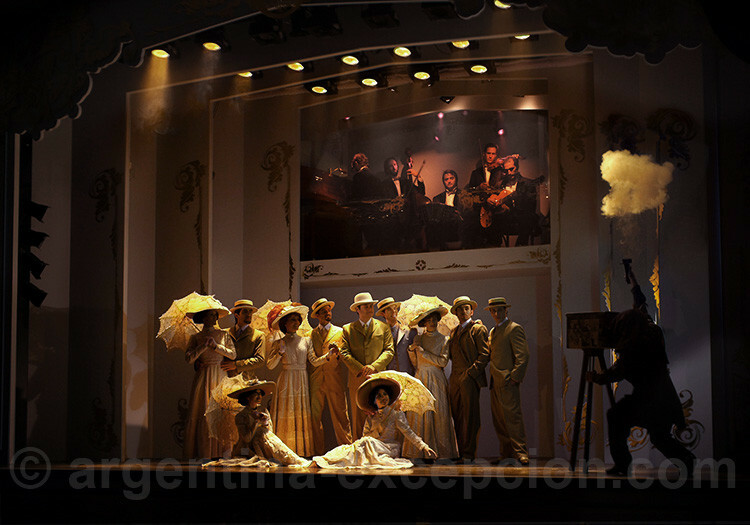 The golden years of the typical orchestra were the 1940s with formations of twelve musicians and one or two singers. Tanda: At the milongas (dance halls), tango is danced in series of four pieces, after each one you go back to the table during the “cortina” and change your partner for a new tanda. Traditionally, tandas take the following order: four instrumental tangos, four sung tangos, three milongas, four instrumental tangos, four sung tangos, three waltzes and it starts all over. Tanguería: A place for tango shows and concerts. Tango canyengue: A little cunning tango at the beginning. The couple dances embraced, with the legs bent down, cheek to cheek, playing and swinging with the music in a very agile manner. The steps are a little bit different than the “classic” tango. 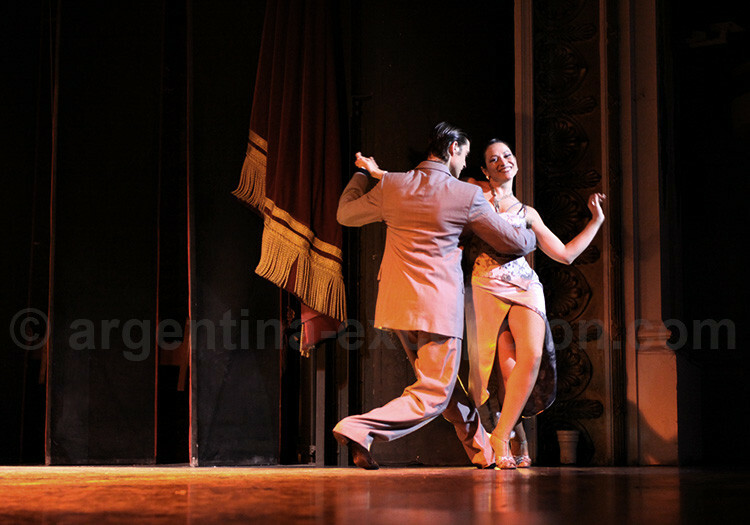 Tango milonguero: The most traditional style of Argentine tango. It is danced embraced and even “piled up” keeping the balance of each dancer over the partner’s axis and not over his own. There are a few complex figures but several variations in the music, communication between the sensual dancers. Tango salón (Ballroom Tango): Another classic style that is danced at the milongas. It is very similar to tango milonguero but with opening of the embrace and more figures. Tango nuevo (New Tango): A recent evolution of the dance inspired in the show fantasy tango, with several complex even acrobatic figures. Amateurs enjoy dancing electronic tango what doesn’t happen among “traditional” dancers. You shouldn’t mistake the new tango for the style created by Astor Piazzolla in the 1960s. Tango canción (Tango Song): Tango singers imposed it in the 1920s and became true and unavoidable stars. Some of the greatest stars were: Carlos Gardel, Roberto Ray, Edmundo Rivero, Raúl Berón, Fiorentino, Floreal Ruiz, Ángel Vargas, Jorge Maciel, Roberto Rufino, Héctor Pacheco, Alberto Castillo, Julio Sosa, Roberto Goyeneche. And the female stars were: Libertad Lamarque, Tita Merello, Mercedes Simone, Ada Falcón. Tango electrónico (Electronic Tango): A recent musical evolution that, as the name shows, mixes tango and electronic rhythms. It is sometimes very different from the traditional tango. Groups: Gotan Project, Tanghetto, Bajo Fondo, etc. Tanguero: Tango dancer. A more neutral word than “milonguero”. Vals (Waltz): Argentine waltz is danced as tango but in three tempos and with many turns and movements. It is one of the three musical styles danced at the dance floors together with tango and milonga. Zapatos (Shoes): An essential attribute of tango dancers. They are flexible, light and with a sole that prevents you from sticking to the dance floor, short heels for men and high heels (10 cm) for women. Tango shoes provide you with elegance and help you keep your balance; they are part of the dancer’s collection. In other times, they “dressed up” to go dancing, that meant to be smartly dressed up. Nowadays dancers may wear jeans and t-shirts, even co-existing with suits or mini-skirts.